My Mum has been visiting me this week. It's always lovely to see her but it ALWAYS wipes me out. Trying to concentrate for long periods of time to have a conversation is very tiring. Not to mention that just sitting a bit more upright and having to use my lungs and diaphragm adds to the fatigue and pain levels. However as well as spending time with my Mum I had the best gift I've received in a long time. My Mum has a friend. This friend, until very recently, had a daughter who has, unfortunately, passed away. My Mum knew the daughter reasonably well but didn't know that she knitted. My Mum and her friend were discussing the painful subject of clearing the home of someone who is now gone and where her belongings should be dispersed to. As the conversation progressed, my Mum showed her friend a photograph of a recent project of mine and from there the conversation was steered towards whether I would be able to use a bag of yarn that needed a home. When my Mum told me about the bag of yarn, I was not particularly hopeful, as I assumed that it would be full of odds and ends of varying standards, like most people's yarn collection would be. However, when my Mum arrived, my socks were blown off! Not a duff yarn among them! I still cannot get over the yarn I have received. It is stunning. 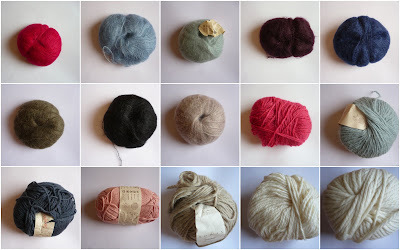 I am still in shock I think, as these are yarns I've drooled over and never had the money to buy. I feel like this is not only a gift from my Mum's friend, but also from her daughter. I never met her, but I think we would have got on. I think we would have found yarn and knitting the common bond that would have sparked a long and interesting conversation. I hope that I can use her yarn in ways that would have made her happy if she had seen it. As you can imagine, I haven't had much time for knitting, as I have been chatting to my Mum and cataloging my stash enhancement. As I consider my cataloging to be a Finished Object, and it is certainly fibre related, I will link up to my usual Friday haunts and suggest if you want to see something other than my long list of pretty yarns, you click on the buttons below!